See also Fuji Kōgaku and Fuji Shashin Kōgyōsha, two older and unrelated companies. Fujifilm Corporation is a Japanese company, which originally appeared as a film manufacturer and later expanded as a camera maker. Before 2006, the corporate name was Fuji Photo Film Co., Ltd. and many photographers continue to use the name "Fuji" informally. The company was founded on January 20, 1934 as Fuji Shashin Film K.K. (富士写真フィルム㈱, later translated as Fuji Photo Film Co., Ltd.), producing several sorts of film. It was an offshoot of Dai-Nippon Celluloid K.K. (大日本セルロイド㈱), founded in 1919. The company's first CEO was Asano Shūichi (浅野修一). The plants were located in the village of Minami-Ashigara (南足柄村, now a city) in the prefecture of Kanagawa (神奈川県), at the foot of Mt. Hakone (箱根山). It is said that the name "Fuji" (富士) was chosen by Asano Shūichi because of Mt. Fuji (富士山), situated not far from Mt. Hakone, but was already registered by a third party, to which the rights were bought for ¥8,000, an important sum at the time. The company started to produce optical glass during the early 1940s for military use. The dependent company Fuji Shashin Kōki K.K. (富士写真光機㈱, meaning "Fuji Photo Optical Co., Ltd.") was founded in 1944, from the assets of Enomoto Kōgaku Seiki Seisakusho (榎本光学精機製作所), but this was absorbed back into Fuji Shashin Film after 1945. Many other Fuji companies were created after the war, all of them dependent of the main Fuji Shashin Film company and eventually of the Fujifilm Group (富士フィルムグループ). 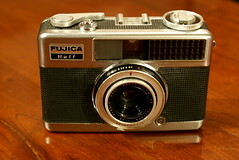 Fuji began producing cameras in 1948 with the Fujica Six. 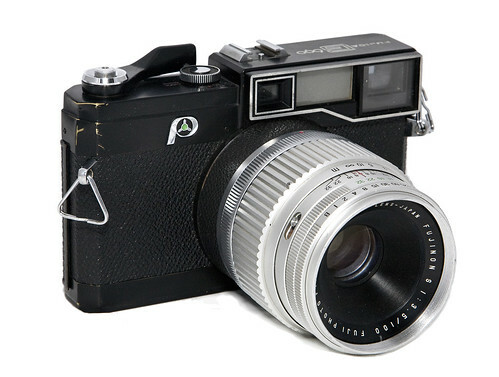 Until the late 1970s, many cameras made by Fuji were called Fujica, a contraction of Fuji and camera (cf Leica, Yashica etc.). 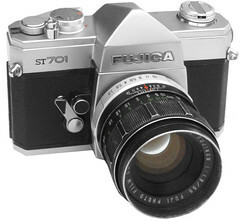 In the mid 1980's the Fujica name change to simply Fuji, in the mid 1990's this changed yet again to Fujifilm. 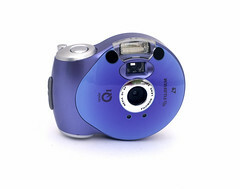 The company started producing digital cameras in 1988. 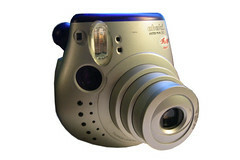 Fujifilm was the most agile among film makers in adapting to digital imaging. For a while it offered leading technology concerning smaller digital consumer cameras with high-sensitivity CCDs (see Super CCD). It also sold expensive DSLRs and innovative camera concepts like the X100 with hybrid finder, a mixture of optical finder and EVF. Nowadays it is one of the big makers of sophisticated CSCs like the X-T3 with fast hi-res video capability. 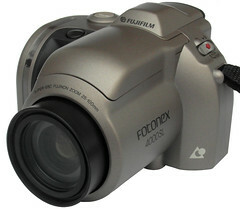 (see Fujifilm digital cameras). Fujfilm branded zoom compacts. 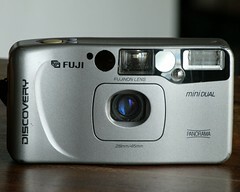 Most American models tend to use the Discovery branding but later cameras share the European branding. 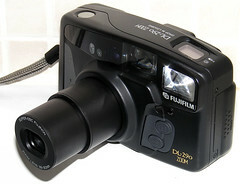 Fujifilm uses multiple brandings for their IX240 APS film cameras. Fotonex is the branding used most everywhere, while Endeavor is in the USA, while nexia and EPION are used in Japan. For all instant cameras and film by Fuji including Instax, ACE, Fotorama, pack film please refer to Fujifilm instant photography. For all digital cameras by Fuji (including DS, Finepix, S-series and MX) and earlier still-video models, please refer to Fujifilm digital cameras. Ars Camera Advertisements by Fuji Shashin Film in January 1946 (p.34) and March 1946 (p.42). Koyasu Yoshinobu (子安栄信). "Fuji Shashin Firumu ryakushi" (富士写真フィルム略史, Short history of Fuji Photo Film). 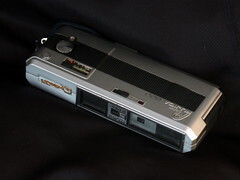 In Kamera Rebyū: Kurashikku Kamera Senka (カメラレビュー クラシックカメラ専科) / Camera Review: All about Historical Cameras no.44, December 1997. ISBN 4-257-13013-X. Tokushū: Fuji Shashin Firumu no kamera (特集：富士写真フィルムのカメラ, special issue on the cameras of Fuji Photo Film). Pp.11–7. ↑ Date and month: Fujifilm history, vol.1, chapter 4. ↑ Fujifilm history, vol.1, chapter 1, and Koyasu, p.11 of Kurashikku Kamera Senka no.44. ↑ Fujifilm history, vol.1, chapter 4. ↑ Koyasu, p.11 of Kurashikku Kamera Senka no.44. ↑ Fujifilm history, vol.1, chapter 10, and Koyasu, p.11 of Kurashikku Kamera Senka no.44. This page was last edited on 16 February 2019, at 09:12.